Think of Bangkok’s gastronomic scene and it’s usually the city’s array of slapdash food stalls that springs to mind. Huge pots ladling out steaming chicken broth, skewers of barbecued meat sold from a portable grill—Thailand's capital is deservedly famous for the devilishly cheap prices and authentic tastes found at such spots. Yet there’s a foodie’s paradise to be discovered that stretches far beyond the rickety plastic stools and exhaust fume–soaked ambience that most tourists associate with snacking on the city's sidewalks. Gaggan bills itself as progressive Indian fare, but this boundary-pushing restaurant—which scooped first place in Asia’s 50 Best Restaurants awards for the third year running—is merely being modest. 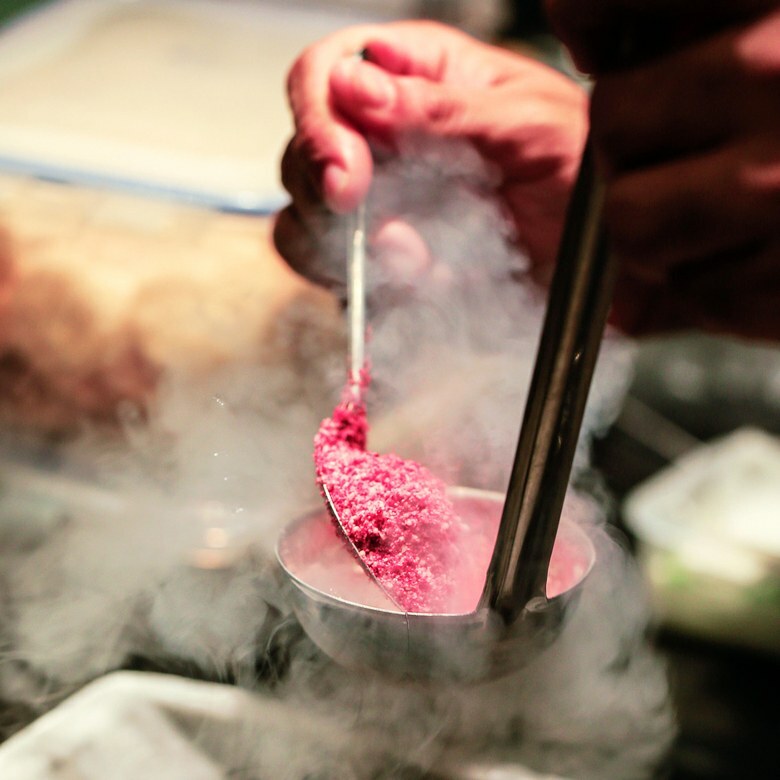 Helmed by Kolkata-born chef and founder Gaggan Anand, its menu takes traditional Indian flavors, adds decidedly modern molecular gastronomy techniques, and ends up with something entirely unexpected. Sign up for the an 25-course tasting menu and settle in for a long night of joyfully creative cuisine. Issaya Siamese Club is housed in a heritage two-story wooden villa, and its timelessness stands out among the flash-in-the-pan trendiness of many of Bangkok’s hot spots. But that’s not to say it’s dull. Jewel-colored walls, clashing prints, wooden ceiling fans, and antique furniture come together in a buoyant take on the colonial-inspired design seen in many older establishments across Asia. Food and drink are equally exuberant, an eye for detail and high-quality produce (some of which is grown in the chef’s herb garden outside) transform well-trod Thai dishes into exciting new creations. In a city where cultural reserve often translates into subdued murmurs around the table, Appia’s lively dining room is a welcome relief. The Italian restaurant—which models itself on a Roman-style trattoria—serves up a short menu of salads, pastas, and meats that keeps the fancy tricks to a minimum. Instead, Italian chef Paolo Vitaletti focuses on rustic-style cooking with high-quality ingredients—just the kind of food you’d imagine your own nonna making. An excellent wine list, and tiramisu based on the chef’s family recipe, are added bonuses. A full stomach is no excuse to skip a course; as the Italians would say, l’appetito vien mangiando (the appetite comes while you’re eating). Sühring may have haute cuisine credentials, but the acclaimed German restaurant insists upon a down-to-earth dining experience. For starters, there’s the fact that twin chefs Mathias and Thomas Suring invite patrons into their own home, a 1970s villa set amid sprawling tropical gardens. And then there’s the food itself, a modern take on Central European recipes from their childhood showcased through eight-course or 12-course tasting menus. Don’t expect stodgy helpings of sauerkraut, schnitzel, or stollen, however—classic flavors are reinvented into contemporary dishes that are light, playful, and filled with fun. There was an uproar when Michelin-starred London restaurant Nahm opened its second outpost in Bangkok—what did Australian-born chef David Thompson know of Thai food? As it turned out, quite a lot; Nahm has gone on to establish itself as one of the city’s finest purveyors of Thai cuisine. Drawing upon traditional recipes and ancient cookbooks, Thompson’s cooking embraces the country’s sturdy flavors, with sweetness, sourness, and spice competing in its curries, stir-fries, and seafood dishes. Save space for the intriguing dessert list, like the Thai wafers with poached persimmon and duck egg noodles. Bangkok’s sizable Japanese expat population has made its mark on Bangkok’s food scene, with ramen restaurants and okonomiyaki outposts as ubiquitous as the city’s 7-Elevens. But superstar chef Masato Shimizu, who rose to prominence after becoming the youngest chef in New York City to win a Michelin star, had loftier ambitions for his tiny sushi restaurant. The minimalist 20-seater space, which takes two sittings each night, operates on an omakase (chef’s selection) basis; for $115 a head, you’ll dine on approximately 20 exquisitely delicate pieces of nigiri, sashimi, and more. Like Sukiyabashi Jiro, the sushi restaurant star of the documentary Jiro Dreams of Sushi, Sushi Masato celebrates the craft of its food first and foremost. No fuss, no frills—just sushi at its finest.